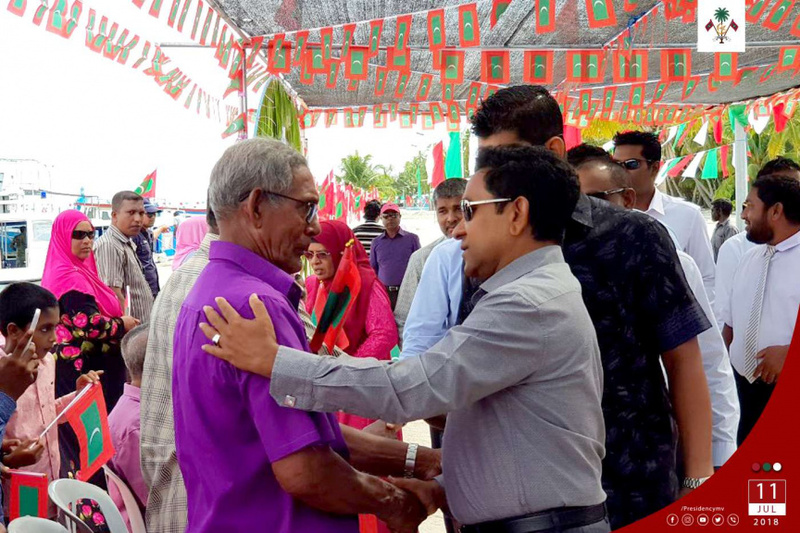 Maldivian President Abdulla Yameen Abdul Gayoom has officially inaugurated the harbor built on M. Kolhufushi. Yameen, who embarked on a two-day tour of M. Atoll last Tuesday, arrived in Kolhufushi this Wednesday morning. Kolhufushi Harbor Project was contracted to Sonak Maldives Private Limited in January, 2016. It was completed in March, 2017. The more than MVR 42 million project was carried out with financial assistance from Islamic Development Bank (IDB). The Kolhufushi Harbor is 550 feet long and 200 feet wide. During the first leg of his tour of M. Atoll, Yameen visited M. Dhiggaru and inaugurated sanitation services and the island’s harbor. He dhen visited M. Mulah and inaugurated sanitation services on the island, following which he visited M. Muli and participated in the function held to mark the completion of the island’s land reclamation project.